Sir Elton John gave a surprise street performance outside Tower Records in Los Angeles to help promote his brand new album ‘Wonderful Crazy Night’. 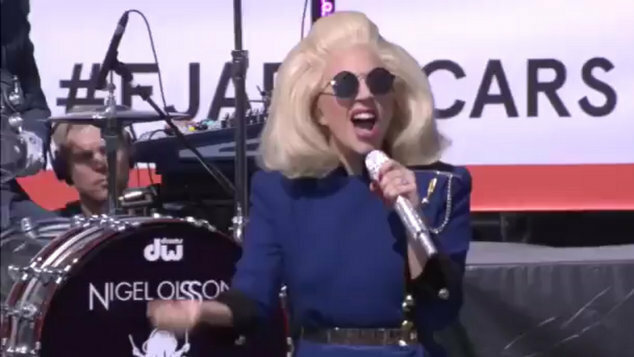 Fans got a double surprise when Lady Gaga joined his on stage to sing two of his classic hits. The Mother Monster joined Sir Elton to sing ‘Don’t Let the Sun Go Down On Me’ before launching into an energetic rendition of ‘Saturday Nights Alright (For Fighting). Elton played for over an hour showcasing songs from his latest album. ‘Wonderful Crazy Night’ is the musician 32nd studio album. His first album ‘Empty Sky’ came out in 1969, but he wouldn’t score a breakthrough hit until people wet crazy for ‘Your Song’ on his second album a year later. “Don’t Let the Sun Go Down on Me’ appears on the 1974 album ‘Caribou’, it was a big hit when it was first released, but also got a second lease of life in 1991 when George Michael performed it live with Elton John as a special guest. The duo had first performed the song years earlier in 1985 at the Legendary Live Aid concert that raised money to fight the Ethiopian famine. Over the years the song has been covered by many singers including Oleta Adams, Bettye LaVette, Roger Daltrey, Gloria Estefan and the late Joe Cocker. Check out the video of the surprise duet below.